Easily and professionally solves the problem of stripped out stock bushing holes. 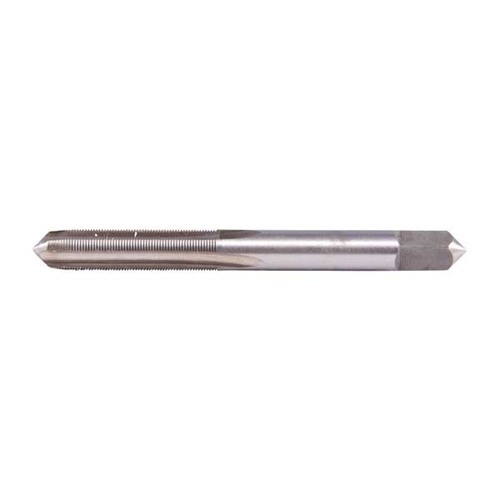 Special tap cleans out stripped frame threads, cuts new ones without pre-drilling. Matching bushing screws right in, uses original grip screw. Will save your life when polishing/bluing, accurizing .45's! SPECS: Bushings - .255"-60, blued steel. Tap - High speed. Enkelt og profesjonelt løser problemet med strippet ut lager foring hull. Spesielle trykk renser ut strippet ramme tråder, kutt nye uten pre boring. Matchende bruker foring skruer høyre, originale grep skruen. Vil spare liv når polering/bluing, accurizing. 45's! 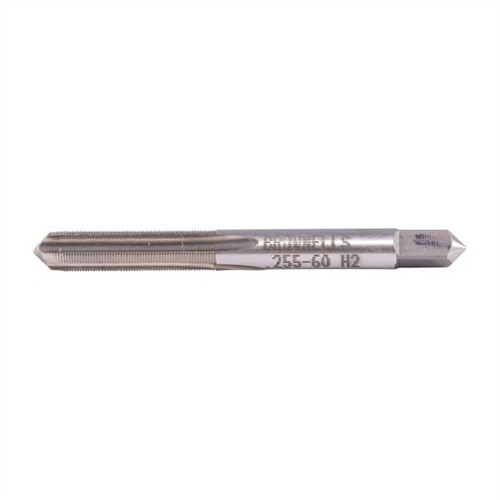 Spesifikasjoner: foringer -.255"-60, blånert stål. Trykk - høyhastighets. I am very dissapointed in the results of using this tool. I followed instructions and was very careful to keep everything aligned. The bushing installed with this tool were cocked. This makes it hard to put the pistol grips on and the bushing threads will probably get buggered again because of not being seated properly.Not to mentioned I screwed up a new Kimber TLE .45 receiver. The problem is that the hole size of the standard bushing is .235 and the tip of the tap is .240 inches. This means you will not get traction till you're 3/4 way through the hole and by that time you will not be aligned perpendicular. The final hole size for the bushing is .255 inches. The solution is to make the tip of the tap to be about .230 inche not .240. If you don't have a drill press using this tool you are not going to like the results. The tap worked fine. Used it on a Kimber CDP in hand tap wrench. Bushings screwed in tight and square. Had no problem getting it started through the existing hole. 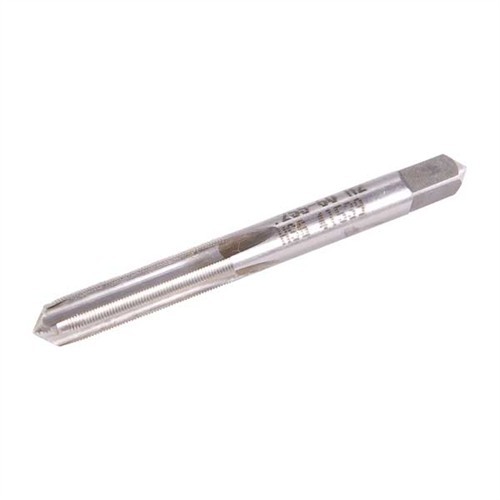 Easy to use in a 1/4" tap wrench. I had to replace grip bushings in my Springfield Champion. This Oversized Grip Bushing Tap worked very well. Easy to do job. It strips the old threads out , then makes new ones. 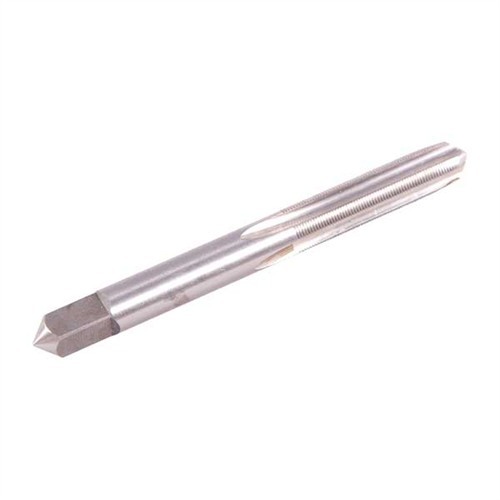 Good to have in the gunsmithing tools. I had a grip bushing strip out on a Kimber Pro Carry - I had neglected to check the bushings regularly for tightness and paid the price. A tip on re-tapping without getting the hole crooked: Cut out a 1" by 1" block from a .75" board. Drill a hole (with a drill-press) in the block just big enough for the tap to pass through without wiggling around. Use the block as a guide to keep the tap perpendicular to the frame of the gun while re-tapping. Holding the block in place with finger pressure was easy for an aluminum frame. For a steel frame that is a little harder to get the tap started into, a C clamp may be required to hold the block steady. One last thing - for an aluminum frame 1911 I wouldn't recommend staking the bushing after install, as the bushing itself is harder than the frame and it can still work loose in time. A SMALL amount of JB Weld holds the bushing in place for good, while leaving the bushing and threads undamaged for future removal if necessary. I used this kit on my Kimber Pro CDP II. Worked very well! Chucked bit in hand-held T handle. Using a small block of wood with a perpendicular hole drilled through it the size of the tap, helps to keep the tap at 90 degrees to the work surface. When I describe myself as a Gunsmith, I mean AMATURE gunsmith. So when I say "easy to use" it's easy. I have a Kimber Raptor that came from the factory with a cross-threaded grip bushing, discovered when the grip came loose after about 100 rounds. I tried getting the original bushing back in correctly, thought it held but then it just broke loose again next trip to the range. I was pretty concerned I'd have to send the thing back to Kimber to get fixed up until I found this oversize tap/bushing set. The PERFECT solution, super easy to use with some care as people people noted to keep the tap going straight. With this aluminum frame gun it cut nice new threads in minutes. Adding to the others tips, I used a bit of Loctite instead of JB Weld, hopefully that holds, but the intent is the same since the bushing is actually harder than the frame I didn't think staking it was a good idea. Also, I'd screw in the bushing just with fingers, no tools, to make sure you don't accidentally cross-thread it. These threads are so so very fine it would be easy to do, and especially with an aluminum frame easy to damage those new threads. I put it in finger-tight until it bottoms out then use a screwdriver to cinch it up. Extremely easy to use. Reluctant at first to attempt to repair a stripped out grip bushing on my 1911. Great product. Had 2 stripped grip bushings (discovered when I went to install my grip). Ordered this off others reviews, and was NOT disappointed. 2 holes tapped, new bushings installed and grips installed in less than 15 minutes (by hand. Tapped the old holes with a hand tap and this bit). Works like a charm if you have stripped GI bushings!!! Produsentnr. : 41539 Enkelt og profesjonelt løser problemet med strippet ut lager foring hull. Spesielle trykk renser ut strippet ramme tråder, kutt nye uten pre boring. Matchende bruker foring skruer høyre, originale grep skruen. Vil spare liv når polering/bluing, accurizing. 45's! Oversized Bushing Set, Basic, 1 set of 4/one tap Enkelt og profesjonelt løser problemet med strippet ut lager foring hull. Spesielle trykk renser ut strippet ramme tråder, kutt nye uten pre boring. Matchende bruker foring skruer høyre, originale grep skruen. Vil spare liv når polering/bluing, accurizing. 45's! Oversized Bushing Set, Deluxe, 6 sets of 4 (24)/one tap Enkelt og profesjonelt løser problemet med strippet ut lager foring hull. Spesielle trykk renser ut strippet ramme tråder, kutt nye uten pre boring. Matchende bruker foring skruer høyre, originale grep skruen. Vil spare liv når polering/bluing, accurizing. 45's! Oversized .45 Bushings, per 1 set of 4 Enkelt og profesjonelt løser problemet med strippet ut lager foring hull. Spesielle trykk renser ut strippet ramme tråder, kutt nye uten pre boring. Matchende bruker foring skruer høyre, originale grep skruen. Vil spare liv når polering/bluing, accurizing. 45's! Oversized .45 Bushings, 6 Sets of 4 (24) Enkelt og profesjonelt løser problemet med strippet ut lager foring hull. Spesielle trykk renser ut strippet ramme tråder, kutt nye uten pre boring. Matchende bruker foring skruer høyre, originale grep skruen. Vil spare liv når polering/bluing, accurizing. 45's! Oversized .45 Bushings, 12 Sets of 4 (48) Enkelt og profesjonelt løser problemet med strippet ut lager foring hull. Spesielle trykk renser ut strippet ramme tråder, kutt nye uten pre boring. Matchende bruker foring skruer høyre, originale grep skruen. Vil spare liv når polering/bluing, accurizing. 45's!